Is your refrigerator running? That old phone prank isn’t quite so funny when your fridge is actually broken. If the refrigerator in your house is malfunctioning, the results are no joke. 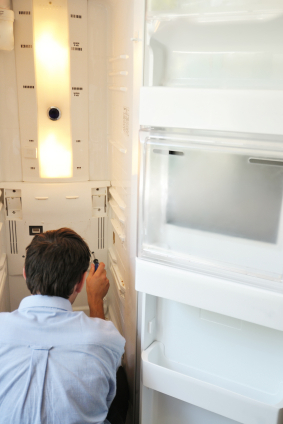 To prevent food spoilage and potential damage from leaks, it’s vital to resolve any refrigerator repair issues at the very first hint of trouble. That’s why Alliance Appliance makes a point of offering prompt and efficient refrigerator repair to homeowners in Milwaukee and beyond. Let our experienced refrigeration repair professionals put our extensive knowledge and skill to work for you. We offer convenient availability for emergencies and weekend appointments, so if you find yourself in need of refrigerator repairs, give us a call as soon as possible! If your fridge is experiencing any of these symptoms, or you’ve noticed a change in the way your refrigerator operates, it may be a sign of a greater issue. Whether you need a replacement door light switch or you’re struggling with the unreliable performance of a malfunctioning condenser, the technicians at Alliance Appliance can provide a quick and thorough solution at a price you can easily manage. We’re fully insured to handle your refrigerator repair work, and we offer the extra assurance of a six-month warranty on every refrigerator repair job we perform. Whether you need GE refrigerator repair or Maytag refrigerator repair, you can rely on Alliance Appliance to ensure swift and expert service for your residential unit. While we specialize in home refrigeration repair for General Electric products, we’re also knowledgeable about the specifications of many major makes and models, including LG, Whirlpool, Frigidaire, and more. Today’s energy-efficient household refrigerators are more sophisticated than ever, with a number of enhanced features to increase their functionality, and we know these models inside and out for precision repairs. Count on our refrigerator repair specialists to eliminate any funny business and keep your kitchen workhorse running up to speed. Don’t wait until the joke is on your refrigerator! Contact Alliance Appliance today to schedule your professional refrigerators repair. Helping homeowners across the Milwaukee region since 2008, our skilled team is standing by now to service your side-by-side, French door, or whatever type of fridge you own. All you have to do is pick up the phone and call!